Last week I had to take my baby boy to the optometrist. His pediatrician told me several months back that his vision screening was ‘borderline’. Now I’ve got a Madonna earworm. And my kid has glasses. I kinda figured as much, considering I’ve worn glasses since first grade. They were pink and little and oh, so cute. His are fancy Adidas frames and he looks adorable. Apparently I’m not the only one who thinks so, either. He got off the bus in a sour mood the other day. Sometimes I take my time and treat him gently to coax it out of him. “NO THEY DON’T”, he said, as he ducked his head to hide a huge smile. I had some friends over on Sunday afternoon. We had a ‘reading party’ with my friend Psychic Lisa Ann. As always, Lisa Ann astounded us with her predictions and observations. I’ve had the honor of knowing this special lady for many years and she’s always been a source of positivity and hope. I was happy to “share her” with my friends. As is always the case when I have guests, I went overboard with snacks. In the interest of making something that dear Irene could nibble on, I dug out this recipe for Italian Polenta Cookies from Martha Stewart Living and made them with Cup4Cup gluten-free flour. This was my first experience with Cup4Cup and I was thrilled. While it is pricey, and thankfully I don’t NEED to use it for health reasons, I like the option of making food gifts for friends with dietary restrictions. I did not source out special Italian polenta. Goya brand coarse cornmeal is my usual choice but if you have a preferred brand, by all means, use it and let me know what it is so I can try it, too. The coarse cornmeal gives these buttery cookies an unexpected crunch and the lemon zest is strong enough to impart a nice lemony flavor so lemon extract is not necessary. In fact, the flavor is nearly identical to my mother’s classic spritz cookies… which explains why I’ve been eating them non-stop. Preheat oven to 350°. Place flour, cornmeal and salt in a bowl and whisk to distribute ingredients evenly. It will take a minute. At first, the cornmeal will be reluctant but you can persevere! Combine butter, sugar and lemon zest in bowl of electric mixer and beat with paddle attachment on medium speed until mixture is light-colored and fluffy, about 2-3 minutes. Scrape down sides of bowl as needed. Turn the speed down a bit and add the eggs, one a time, beating well after each addition. Stir in the vanilla extract. With mixer on low speed, gradually add flour mixture. Be sure to scrape down the bowl to incorporate all dry ingredients. Transfer dough to a pastry bag fitted with a large star tip and pipe S-shapes onto parchment lined sheet pans. Alternatively, spoon out blobs of dough and flatten slightly before baking. Bake until cookies are golden around the edges, about 15 minutes. Let cookies cool on pans on racks for about 10 minutes, then slide them, parchment and all, onto a rack to cool completely. This parchment baking and cooling step is especially important with gluten free cookies, in my opinion, as they tend to be more delicate than those made with all-purpose flour. I read this article and found it very interesting, thought it might be something for you. 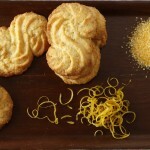 The article is called Pulling Pigtails, plus Gluten-Free Lemon Cornmeal Cookies and is located at https://thefarmgirlcooks.com/pulling-pigtails-plus-gluten-free-lemon-cornmeal-cookies/. a lot of the my recipes use almond flour, i’m sure these flavors would work lovely with it. great photos too. Absolutely! Almond flour would work very well here. Now… I’m very curious about this whoopie pie cream filling. And anything with coconut milk is my downfall 😉 Love your blog! 🙂 I have several friends who enjoy a vegan diet. I’ll be sure to recommend your recipes.